Treatments of walls formwork and extrados, both inside and the outside with different solutions. APPLICATIONS: Applied as a second coat to reinforce Xypex concentrate, or applied for waterproofing the exterior of basement walls. Waterproofing Is a creamy black-brown color, based on bitumen modified with chloroprene to give the product greater elasticity and resistance to atmospheric aging. APPLICATIONS: Waterproofing small, medium and large surfaces such as decks, roofs, decks, pools, planters, etc. Waterproofing bitumen-polymer Bitumen-polymer waterproofing: Waterproofing based on polymeric dispersion of polimeric bitumen, cold applied, highly flexible, elastic and resistant to aging, easy and safe to use. 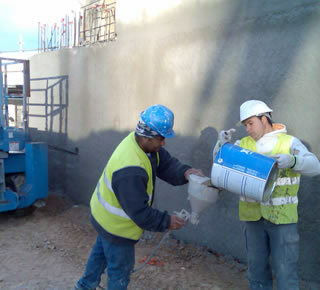 Do you want information about Waterproofing on wall formwork?